Home / Hanukkah and Christmas Gift Baskets! Free Shipping! 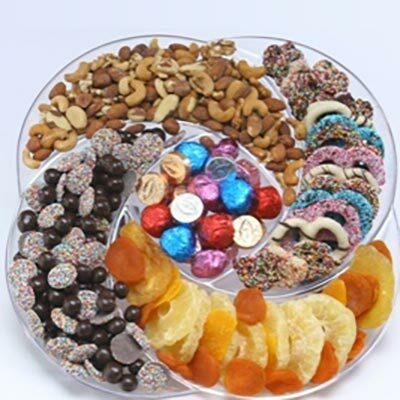 / Spectacular Platter - Free Shipping! 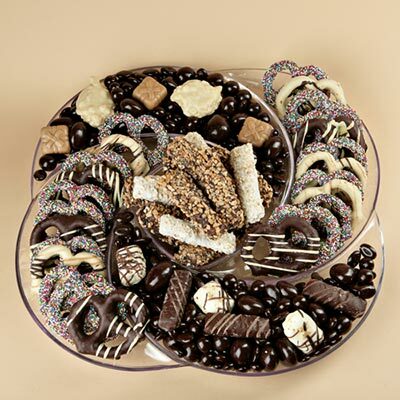 A gorgeous large gift platter teeming with delicious chocolate pretzels, sour bears, honey glazed almonds and pecans, mixed chocolates, Viennese Crunch,nonpareils, jelly beans and cranberry nut mix and topped with foiled covered truffles in the center. Great for a large gathering of family and friends for a holiday or special occasion!